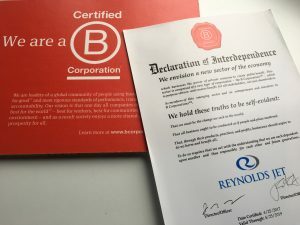 We are very excited to share that Reynolds Jet recently became B Corporation Certified (Read the full press release here). In earning this certification, we are the first aviation company – business or commercial – to receive this esteemed designation. To earn the certification, we subjected our entire business operations to a rigorous independent assessment for social and environmental performance, public transparency and legal accountability. The assessment measured the positive impact of our company with five core sections; corporate governance, worker engagement, community, Environment and our aircraft management and private jet charter services that we provide to our customers. This global community of B Corporations represent a new breed of businesses – these for-profit companies are competing not only to best in the world, but the best for the world. This accreditation recognizes people using business as a force for good, much like Fair Trade Certification is for coffee or USDA Organic certification is to milk. It helps customers and consumers identify who the change makers are; those that are making a social difference, or safeguarding people and the planet. Times change, but our dedication to providing a better service never will. We are proud of our heritage in delivering exceptional boutique aircraft management services and private jet rentals in Cincinnati and the surrounding Tri-State region. This new chapter in the Reynolds Jet story is an extension of our desire. Through our business jet operations, we want to make things better and more comfortable for children receiving specialized care at the Cancer and Blood Diseases Institute at Cincinnati Children’s Hospital. To that end our renewed mission is to provide private jet flight time to families by providing them access to fly privately. The net profits, from our core business of private jet travel services, are placed on a private jet card account to then provide this air transportation to children and their families in need of specialized cancer care. Together with Cincinnati Children’s Hospital, we believe that small acts have tremendous impact. This mission driver – recognized and supported by B Lab’s B Corp certification – aligns every conversation and decision around the company in order for us to maximize net profits. The greater the net profit, the more families we can fly in and out of Cincinnati. There are more than 2,140 Certified B Corporations from over 130 industries in over 50 countries with 1 unifying goal – to redefine success in business. To find out more about B Corps check out www.bcorporation.net. Gray Charter. “Part 134 1/2”. What is Illegal Jet Charter? Reynolds Jet flights are operated under Midwest Jet Management LLC certificate YWJA840K (dba Reynolds Jet), or arranged with other direct air carriers licensed to operate under Part 135 as registered with the U.S. Department of Transportation, that exercise full operational control of charter flights at all times. 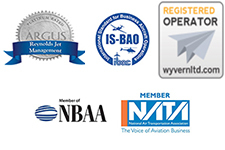 Those flights that are not operated under the Midwest Jet Management LLC certificate will be operated by FAR Part 135 direct air carriers that have been certified to provide service for Reynolds Jet clients and that meet all FAA safety standards and additional safety standards established by Reynolds Jet.